Immaculate, custom 1900+ square foot, three bedroom home on Park Hill. Almost completely remodeled âdown to the studsâ (â¦and even past the studs in some areas!) in 2013. 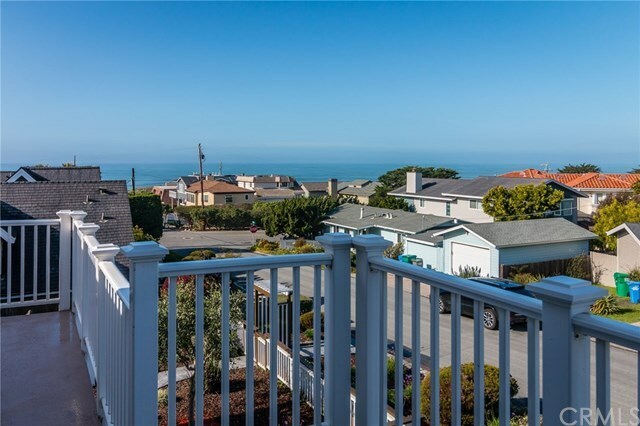 Enjoy ocean views from virtually every room of the house, with the best ones coming from the huge, Northwest- (i.e. sunset-) facing deck. These panoramic views allow you to see the ball of the sun dropping into the Pacific Ocean from June to December, and back up to June. Enjoy a like-new kitchen, with high-end stainless steel appliances and granite countertops. The pass-through window above the kitchen sink allows for ocean views even while doing the dishes! This highly desired Park Hill location offers walk-ability to the ocean, The Ranch, Shamel Park, Moonstone Beach and townâs West Village. Whitewater views up the coast line include the Cove and the lighthouse, the southern part of Big Sur, and the shot of Hearst Castle. The attention to detail is impressive throughout, including decorative framing and finish carpentry around the windows, doors, ceilings and the fireplace mantel. The remodel included a new roof, updated bathrooms, new windows, shutters, wood floors and more! Staircases lead to two separate, VERY private master bedrooms. There are garages, with significant storage space in both, and a framed-in washer and dryer room. This triple lot boasts a low maintenance, landscaped and fenced yard, finished with stacked stone raised flower beds and flagstone walkways. Directions: From Hwy 1 N, turn left at the light onto Windsor Blvd., turn left onto Plymouth Street. The property will be on the right.